All the gear is loaded, crew accounted for, and we are finally underway. The cruise plan will take us out from St. Petersburg into the deep waters of the upper Gulf of Mexico. We are scheduled to reach our first station about 30 hours from now, so the crew and science team are using the time to settle in, organize gear, and label jars for sample collection. 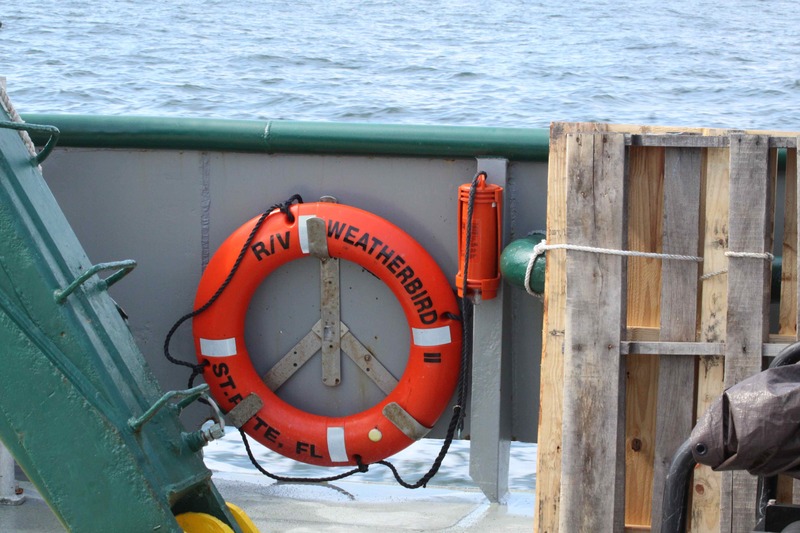 It seems like a good time for us to talk about why we are heading out to sea, and what the scientists on board are hoping to find out. In June of 2010, an explosion on the Deepwater Horizon drilling rig and the subsequent failure of its blowout preventer caused one of the greatest environmental disasters in the history of the United States. As a resident of Florida, I remember hearing the news of the incident and feeling like crying. Having lived in Alaska, I knew the long-term consequences of the Exon Valdez spill, and immediately images of birds drenched in oil and black tar washing up on shore came to mind. What made it even worse was that, because of the extreme depth, no one seemed able to staunch the flow. Instead of a single incident that we could assess and begin to control, we saw images of the oil gushing from the well site day after day and felt powerless to do anything. I remember scheduling a last minute dive trip to the Gulf with a friend in case it was the last chance we would have. By the end, 200 million gallons of oil spilled into the Gulf of Mexico. 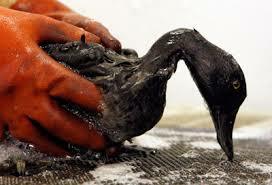 75% of this oil stayed in the Gulf and is subject to natural degradation, or to being broken down by natural processes. During the crisis, all eyes were focused on the oil and where it was going. However, all of our models and data came from previous near-shore or surface spills. It turned out that many of the assumptions we made based on previous oil spills did not really hold true. Deep water spills behave differently, and things we knew to be true (like oil and water don’t mix) turned out not to hold true in this case. We were left with so many questions, and not enough data to draw conclusions about the short and long term effects of the disaster. Another complication was the use of dispersants. Dispersants are chemicals that disrupt masses of oil into tiny droplets that are then spread throughout the water. While the long term consequences of these chemicals may turn out to be more important than the oil itself, at the time, the primary goal was seen as preventing the oil slick from destroying the delicate estuaries and aquatic systems in the Panhandle and Louisiana. And as far as it goes, they probably served this purpose. The effect they have on the water column and the living system of the deep water Gulf remains to be seen. In discussing the trip with Dr. Teresa Greely before we left, I was very surprised to learn how little we actually knew about the Gulf of Mexico before 2010. For a region that contains 9% world’s oil and 11% world’s gas, four of the world’s top producing fishing ports, and is the final destination of most of the water discharged by US rivers, it was practically unstudied. The oil spill changed that. Without being compelled by law (settlements came later) BP funded a 10-year, $500 million independent research program with the Gulf of Mexico Alliance to study the effects of the Deepwater Horizon incident and the potential associated impact of this and similar incidents on the environment and public health. This funding allowed independent scientists willing to study the Gulf system to investigate the effects of the oil spill. In fact, our C-Image project would not be happening now without the funding from by BP. 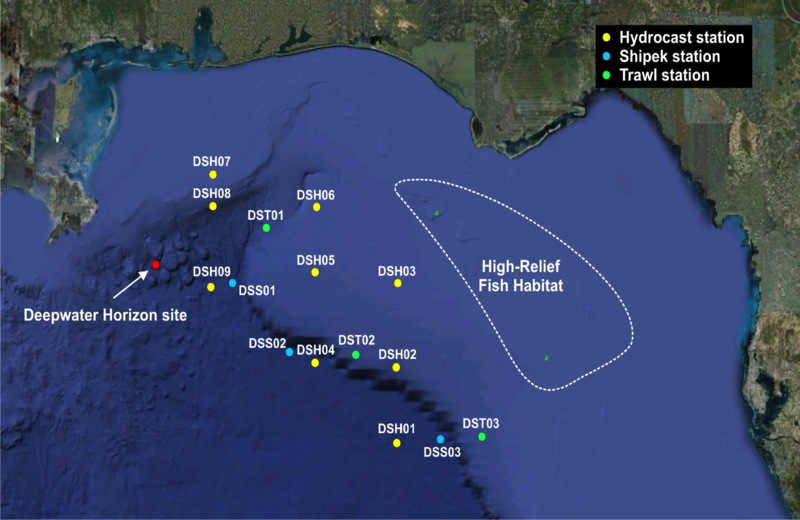 Over the past three years, we have discovered so much about the complexity of the Gulf as we try to determine the impact of the Deepwater Horizon oil spill. This map shows the different sampling stations for the C-Image project. We are heading to PCB11, and should get there sometime tomorrow afternoon. There are three basic goals of the C-Image project. First, scientists needed to determine where the oil went. Core sampling show that much of the oil ended up in a sediment layer, and has since been burning in new deposits of sediment. Second, we needed to find out what impact the spill had on the living elements of the Gulf system, from the tiniest plankton species to the large mammals (which includes us!). Over the past three years, water samples have been collected from both oiled and non-oil stations. Measures of both the quantity of life (biomass) and the diversity of species will help us determine how the spill has impacted the foundation of all life in the Gulf. 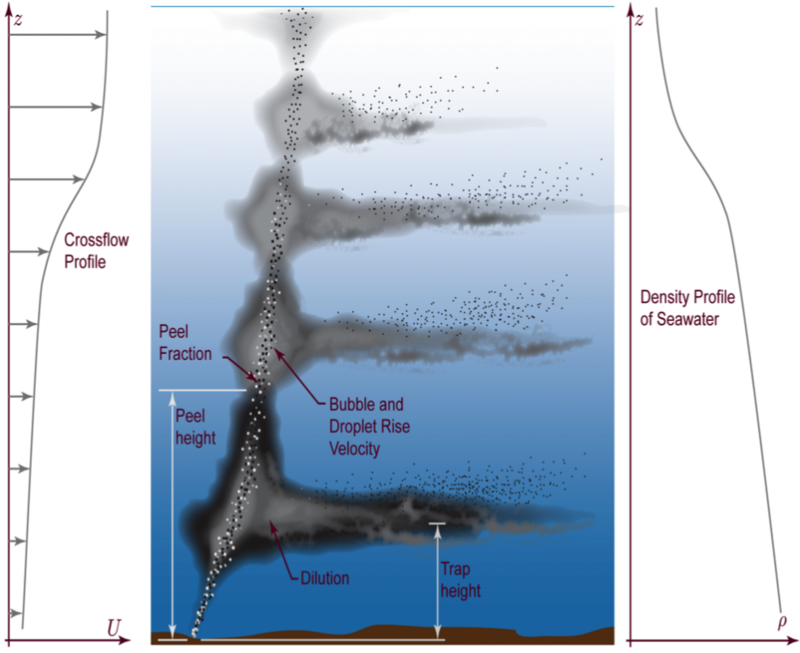 Finally, scientists need to take all of the information we have learned working both in the field and in the lab to create a complex model of how deep water spills behave so we are better prepared to deal with future incidents. Print article This entry was posted by greely on August 5, 2013 at 2:08 pm, and is filed under Oceanic Updates. Follow any responses to this post through RSS 2.0. You can leave a response or trackback from your own site.